Twin brothers Charlie and Chalkie, as we settled to call them, were coming up to three weeks old, playing in the field happily and with bounds of energy. Both seemed to be growing well and loved to jump on the hay bale we had put in the field for them. They were becoming increasingly inquisitive, always together and learning to nibble on grass whilst spending more and more time a little further away from their mum. Both fed well when they were called by her and all seemed perfectly fine. One evening last week, in an effort to meet the needs of both the two pregnant Shetland ewes and the Welsh Mountain ewe lactating two growing lambs, we moved our little flock to a field of fresh grass. The next morning, when I went to check them as I do every morning, Chalkie was dead. At first, I thought he had been got by something. He did have wounds when I found him and his little body of white wool was blood stained. I used all the courage I could muster to take a look at him, then pick him up and take him back to the house where I needed to make some phone calls to arrange for him to be disposed of according to the law. I phoned our neighbour Paul to find out the contact number of the local person dealing with fallen stock. Paul then came to take a look at Chalkie to see if he could shed some light on what may have happened to him. We now think that his wounds were from ravens who got to him after he died. There was no sign of a struggle or bite marks; in any case, he was way too big for a fox. He was stone cold when I found him so he must have died some time in the night (he was still well and running around when we checked the flock at around 9pm the previous evening). He must have died suddenly of something that was not visible beforehand. He was just about the right age for Coccidiosis but with none of the symptoms other than death, it is probably unlikely. It's hard not to know what happened. In my distress and distraction (I needed to prepare the shepherd's hut for a booking that had come in late the night before and I had a house full of guests still with us after my birthday celebrations), I didn't think to take him to the vets to have his death investigated. We have done a lot of reading since to try and make sense of his death; we now wonder whether a vaccination programme to protect against clostridial diseases would be helpful although with only 6 sheep, it does present challenges as the medication is sold in large volumes... Vaccination is not mandatory so, unless every sheep does get vaccinated, its impact is currently limited. For the first 12 hours following his death, Chalkie's mum was distressed, calling him every time Charlie came to feed. She knew one of her lambs was not there. She has now settled down and continues to look after her and feed her one lamb well. No doubt, her milk production will adjust to meet the needs of just one lamb. I feel sorry for Charlie who has now lost his playmate and finds himself the only lamb in a flock of ewes. Our two Shetlands are due between now and 16 May so fingers crossed that they lamb sooner rather than later. Each livestock death is hard for any smallholder. 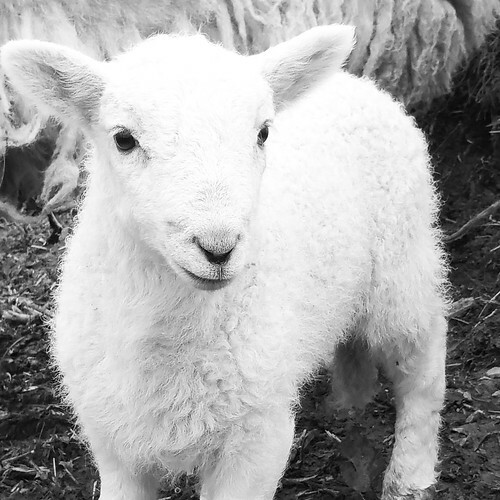 It is especially tough with a tiny flock such as ours: the death of one out of two lambs is a cruel and painful loss. There is no doubt that my confidence and resilience have been knocked this week. Goodbye, dear little Chalkie, we miss you and your skippy jumps about the place.